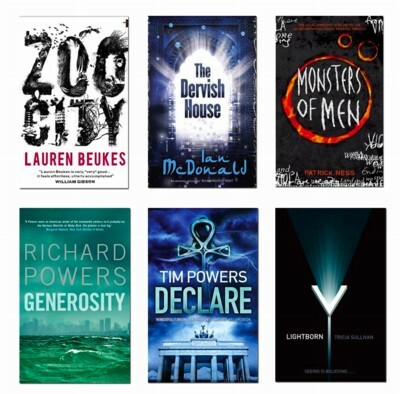 The shortlist for the Arthur C Clarke Award is, gratifyingly, never quite what anyone thinks it will be in advance. I doubt even any given juror could have correctly guessed what their consensus would determine when they met to collectively choose the shortlist for the twenty-fifth anniversary of the award. The Arthur C Clarke Award is a juried award for the best work of science fiction published in Britain in the previous year. It’s judged from the works submitted by publishers so it’s theoretically possible for the award to miss out on options they would have liked to consider had they only been submitted. The “published in Britain in the previous year” is why an award-winning novel published in 2000 made it onto the shortlist this year: Tim Powers’s Declare only had its first UK publication in 2010. These are six books from six different publishers (out of the twenty-two which submitted books this year), by four men and two women, one culmination of a trilogy, and five standalones. As more than one has already commented, the list features four authors of American origin (although some of them have lived in the UK for years) and one South African, Lauren Beukes. Only one of them, Ian McDonald, has been British and lived in Britain for the majority of his life. This is a point worth mentioning because the Clarke Award is specifically a British award, albeit for what’s published in the country rather than where those authors come from. In more trivial statistics: one-word titles make up 50% of the shortlist, but that’s not too disproportionate – they made up 27% of the list of eligible submissions. It was also a good year to have the last name “Powers”. The shortlist was chosen by this year’s judging panel: Jon Courtenay Grimwood and Martin Lewis for the BSFA, Phil Nanson and Liz Williams for the Science Fiction Foundation, and Paul Skevington for SF Crowsnest.com. Paul Billinger chaired the judges on behalf of the award. They will all be busy re-reading the shortlist in the coming weeks, in preparation for the jury’s final meeting to choose the winner. I’m looking forward to reading this list too; from the reviews I’ve read and initial reactions to the shortlist, it looks like quite a good one. I’ve only read Lightborn so far, although conveniently, I started Zoo City yesterday and have The Dervish House handy since I’m reading the BSFA novel shortlist, and those three books (but no others) overlap with the Clarke shortlist. In the weeks between now and the 27th of April, when the jurors, having reread the shortlist, will meet again to decide on the winner, and the award will be given at the SCI-FI London Film Festival, I look forward to reading all the discussion, speculation, and guesswork about just which of these books will take the prize and why it’s worthy of doing so. A few more reactions: Nic Clarke, Amanda Rutter, and me. Niall: Thanks! I’ve updated the post. Yay for Zoo City! One of my top reads of 2010. I was surprised to see Declare up there, since it is an older title. . . but that’s a great read as well. I haven’t read the others. Will be interesting to see which genre crit, hoops Zoo City and Declare are now tortured through to earnestly explain how they aren’t fantasy at all……. Nice to see that, despite being massively under-represented (in terms of general population rather than – I suspect – the shape of genre publishing as a whole) there are two novels on the shortlist! A testament to their quality, I think. Oh, good grief. Proof-read your posts, Richard. I, of course meant books written by women. Gah! Richard: Thanks for the correction. I had been sorely tempted to ask which four books were bearing the brunt of your sarcasm! Ahahaha. I feel that I have compounded my initial foolishness by failing to scan my correction and have left a stupid grammatical error in it. I shan’t be correcting that though. Less meaning is lost through that one! Do note that this is last year’s shortlist. This year’s should be posted within the next month.